proposal → friendly amendment → amended proposal → friendly amendment → ... → ultimately consense or give up. I've also had the experience of being in various groups that use some version of formal consensus in which there's a boilerplate agenda something very much like "Introductions; working group reportbacks; possible special presentation; proposals; announcements and closing." That is, the only collective decision making takes the form of receiving a proposal and deciding what to do with it. In my experience in various groups, and I don't know how widespread this is, you're not allowed to make counterproposals while a proposal is on the table, or any other suggestions except in the form of concerns or friendly amendments. A decision has to be reached whether to block, postpone, or adopt the proposal (with or without amendments) before other things, including other proposals, can be discussed. Also, on a more positive note, in thinking about the general idea of looking for a good solution to a problem - i.e. a mutually acceptable location in the space of possible proposals for a given problem domain - I came to find this idea limiting. Wouldn't it be better in some circumstances to say, "Let's take a certain amount of time to talk about a certain issue, and see whether there's anything we'd like to do about it"? We could start by trying to clarify what we know about the issue, make sure we agree that there's a problem to be addressed, lay out multiple possible proposals and find out what people think about them, and then see whether an answer has emerged, or whether there's a need to pick out particular proposals and discuss them. Like I wrote in my plan for March, I want to reconceive the simulation model so that it can include things like brainstorming and comparing multiple proposals, not just considering a single proposal at a time. Maybe I'll try asking what's the simplest possible extension of the model that can include brainstorming, to see how far it gets me. 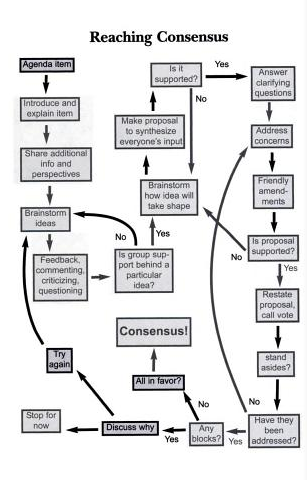 I'm curious whether that will reveal that brainstorming is at one end of a certain spectrum (I don't know what spectrum, yet), with taking one proposal at a time at the other end, and if so it'll be interesting to see what lies in between the two ends of that spectrum. In the July models, when I was only considering what to do with a model, I had the issue of how to formalize what a concern is. In my model, proposals were just anonymous points in a big space, and you could really just say how much you do or don't like one of them, and propose another one in its place: there's no way to say what you don't like about it. That requires some kind of language for talking about the proposal, or another way to look at it might be a way of naming sets of proposals and not just single points in the space. For instance, when I say, "I don't want to get the onion, mushroom and tomato pizza because I don't want onion", I'm saying that all the possible pizzas that include onion are, uh, off the table - which helps the process along quite a lot because it rules out a big chunk of the search space. It seems like I really need a clear way to handle this subset issue. Other issues have been emerging as well, which I might write up separately: what difference does it make that people don't change their point of view from listening to each other; what difference does it make that people don't consider "the good of the group" as well as their own desires, for instance wanting to come to agreement quickly or to avoid conflict; and are people likely to use strategy to get more desirable outcomes for themselves, not just something they're willing to accept.